Aries Lift Up Vane Gear Installation. The Lift-up design was a development of the original Aries which was in continuous production from 1970-1992. I feel the main the design problem with vane gears in the world up to now has been the difficulty of fitting and removing the servo rudder in the water (or the auxiliary rudder on the direct acting types). Quite a few designs allow the servo rudder to hinge out of the water but this is not good enough as there is still the problem of fitting the rudder on its shaft low down the transom from deck level. Experience has shown that another major problem and worry to owners is collision damage to the vane gear when in harbour. It only needs a small mistake when manoeuvering to smash the gear. Both these problems were solved with the Lift-up design. You can hinge the servo rudder up to vertical within seconds standing at deck level and only using one hand. A quick release plunger allows instant removal of the servo rudder. Operation of the two knurled collars on the hinge pin enables the mainframe to be lifted off the crosstube casting. The crosstube and mounting tubes are released from the four transom brackets by pulling the quick release plungers with one finger. When aboard, the two rope take-off tubes can be removed from the mainframe casting which makes this part of the gear stow flat. The entire mechanism fits into the bottom of the small cockpit seat locker. 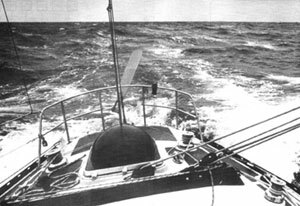 I believe the only practical design of vane gear capable of controlling a yacht at high speed in heavy weather is the servo pendulum type such as Aries which operate the tiller or wheel via ropes. In fact a yachts main rudder is astonishingly efficient when you consider that a small amount of force on the helm will control a hull weighing perhaps 20 tons in large seas. The servo rudder only has to develop a small force equal to that of the helmsman. I feel that any other vane system such as locking the main helm and using the vane gear to steer the boat directly cannot offer the same steering control especially in heavy weather. The vane's rudder would have to be large enough to redevelop a sufficient force but you would then be faced with severe structural problems transmitting this to the transom. The vane can be operated entirely from the normal steering position in the cockpit by use of the two course adjusting lines and wheel drum unit or tiller clamp and chain. One pull of the course adjusting lines theoretically alters course 6° but this depends on the amount of weather helm present. Very small course alterations can be made by adjusting the tiller clamp or wheel drum clutch but this is normally not required. I much prefer this method of course adjusting lines as compared to a wormwheel and line as you can tell exactly how much adjustment you are applying. This is especially useful at night. 6mm marine plywood is used for the wind vane. I tried other materials but none of them compare with plywood for this particular purpose. The size is not important but the vane must always slowly rise to vertical when released from full deflection.